The Fact that None are Prepared to State that the 'Official Version' is a Pack of Lies, means that we cannot trust ANYTHING they say about Enemies, Terrorism or their Policy Objectives for Peace and Stability in the World. In the Face of such Overwhelming Evidence of Corruption, Collusion and Misrepresentation of the most Grievous Kind, no Government can expect the Confidence or Support of their Populations until those Same Governments 'Come Clean'. It is hard to predict the consequences when they do! America’s “War on Terrorism” by Michel Chossudovsky Buy Now! This text first published in August 2012. It was reposted on September 11, 2016 in the context of the 15 years commemoration of the tragic events of 9/11, September 11, 2016. It proivdes a detailed introduction and overview as well as a collection of articles by Global Research authors on 9/11 and the “Global War on Terrorism”. The tragic events of September 11, 2001 constitute a fundamental landmark in American history. a decisive watershed, a breaking point. Millions of people have been misled regarding the causes and consequences of 9/11. September 11 2001 opens up an era of crisis, upheaval and militarization of American society. Endless wars of aggression under the humanitarian cloak of “counter-terrorism” were set in motion. September 11, 2001 marks the onslaught of the “Global War on Terrorism” (GWOT), used as a pretext and a justification by the US and its NATO allies to carry out a “war without borders”, a global war of conquest. At eleven o’clock, on the morning of September 11, the Bush administration had already announced that Al Qaeda was responsible for the attacks on the World Trade Center (WTC) and the Pentagon. This assertion was made prior to the conduct of an indepth police investigation. Secretary of State Colin Powell called the attacks “an act of war” and President Bush confirmed in an evening televised address to the Nation that he would “make no distinction between the terrorists who committed these acts and those who harbor them”. That same evening at 9:30 pm, a “War Cabinet” was formed integrated by a select number of top intelligence and military advisors. And at 11:00 pm, at the end of that historic meeting at the White House, the “War on Terrorism” was officially launched. The tragic events of 9/11 provided the required justification to wage war on Afghanistan on “humanitarian grounds”, with the full support of World public opinion and the endorsement of the “international community”. Several prominent “progressive” intellectuals made a case for “retaliation against terrorism”, on moral and ethical grounds. The “just cause” military doctrine (jus ad bellum) was accepted and upheld at face value as a legitimate response to 9/11. In the wake of 9/11, the antiwar movement was completely isolated. The trade unions and civil society organizations had swallowed the media lies and government propaganda. They had accepted a war of retribution against Afghanistan, an impoverished country in Central Asia of 30 million people. The myth of the “outside enemy” and the threat of “Islamic terrorists” was the cornerstone of the Bush administration’s military doctrine, used as a pretext to invade Afghanistan and Iraq, not to mention the repeal of civil liberties and constitutional government in America. Amply documented but rarely mentioned by the mainstream media, Al Qaeda is a creation of the CIA going back to the Soviet- Afghan war. This was a known fact, corroborated by numerous sources including official documents of the US Congress, which the mainstream media chose to either dismiss or ignore. The intelligence community had time and again acknowledged that they had indeed supported Osama bin Laden, but that in the wake of the Cold War: “he turned against us”. The 9/11 Commission Report has largely upheld the “outside enemy” mythology, heralding Al Qaeda as the “mastermind” organization behind the 9/11 attacks. The official 9/11 narrative has not only distorted the causes underling the collapse of the World Trade Center buildings, it has also erased the historical record of US covert support to international terrorism, while creating the illusion that America and “Western Civilization” are threatened. Without an “outside enemy”, there could be no “war on terrorism”. The entire national security agenda would collapse “like a deck of cards”. The war criminals in high office would have no leg to stand on. After 9/11, the campaign of media disinformation served not only to drown the truth but also to kill much of the historical evidence on how this illusive Al Qaeda “outside enemy” had been fabricated and transformed into “Enemy Number One”. The 911 Reader is composed of a carefully selected collection of key articles published by Global Research in the course of the last eleven years. 9/11 was an important landmark for Global Research. Our website was launched on September 9, 2001, two days prior to 9/11. Our coverage of 9/11 was initiated on September 12, 2001. Within this collection of more than 60 chapters, we have included several important reports from our archives, published by Global Research in the immediate aftermath of the attacks. These articles provide a focus on issues pertaining to the 9/11 Timeline, foreknowledge of the 9/11 attacks, the attack on the Pentagon, the issue of insider trading on Wall Street in the days preceding 9/11 pointing to foreknowledge of the attacks. What prevails is a complex web of lies and fabrications, pertaining to various dimensions of the 9/11 tragedy. The falsehoods contained in the official 9/11 narrative are manifold, extending from the affirmation that Osama bin Laden was the mastermind, to the assertion by the National Institute of Standards and Technology (NIST) that the WTC buildings collapsed due to the impacts of fire. (see Part III). Is there any proof to the effect that Osama bin Laden, the bogeyman, coordinated the 9/11 attacks as claimed in the official 9/11 narrative? According to CBS news (Dan Rather, January 28, 2002), “Enemy Number One” was admitted to the urology ward of a Pakistani military hospital in Rawalpindi on September 10, 2001, courtesy of America’s indefectible ally Pakistan. He could have been arrested at short notice which would have “saved us a lot of trouble”, but then we would not have had an Osama Legend, which has fed the news chain as well as presidential speeches in the course of the last eleven years. DAN RATHER. As the United states and its allies in the war on terrorism press the hunt for Osama bin Laden, CBS News has exclusive information tonight about where bin Laden was and what he was doing in the last hours before his followers struck the United States September 11. This is the result of hard-nosed investigative reporting by a team of CBS news journalists, and by one of the best foreign correspondents in the business, CBS`s Barry Petersen. Here is his report. (BEGIN VIDEOTAPE) BARRY PETERSEN, CBS CORRESPONDENT (voice-over): Everyone remembers what happened on September 11. Here`s the story of what may have happened the night before. It is a tale as twisted as the hunt for Osama bin Laden. 2. The hospital was under the jurisdiction of the Pakistani Armed Forces, which has close links to the Pentagon. Osama bin Laden’s whereabouts were known to both the Pakistani and US military. U.S. military and intelligence advisers based in Rawalpindi. were working closely with their Pakistani counterparts. Again, no attempt was made to arrest America’s best known fugitive. Defense Secretary Donald Rumsfeld claimed, at the time, that the whereabouts of Osama bin Laden were unknown. According to Rumsfeld: “Its like looking for a needle in a stack of hay”. The immediate response of the US and its allies to the 9/11 attacks was to the declare a war of retribution against Afghanistan on the grounds that the Taliban government was protecting “terror mastermind” Osama bin Laden. By allegedly harboring bin Laden, the Taliban were complicit, according to both the US administration and NATO, for having waged an act of war against the United States. Parroting official statements, the Western media mantra on September 12, 2001 had already approved the launching of “punitive actions” directed against civilian targets in Afghanistan. In the words of William Saffire writing in the New York Times: “When we reasonably determine our attackers’ bases and camps, we must pulverize them — minimizing but accepting the risk of collateral damage” — and act overtly or covertly to destabilize terror’s national hosts”. This decision was taken by the Bush-Cheney war cabinet in the evening of September 11, 2001. It was based on the presumption, “confirmed” by the head of the CIA that Al Qaeda was behind the attacks. On the following morning, September 12, 2001, NATO’s Atlantic Council meeting in Brussels, endorsed the Bush administration’s declaration of war on Afghanistan, invoking Article 5 of the Washington Treaty. An act of war by a foreign nation (Afghanistan) against a member of the Atlantic Alliance (the USA) is an act of war against all members under NATO’s doctrine of collective security. Under any stretch of the imagination, the attack on the World Trade Center and Pentagon cannot be categorized as an act of war by a foreign country. But nobody seemed to have raised this issue. Meanwhile, on two occasions in the course of September 2001, the Afghan government –through diplomatic channels– offered to hand over Osama Bin laden to US Justice. These overtures were turned down by president Bush, on the grounds that America “does not negotiate with terrorists”. The war on Afghanistan was launched 26 days later on the morning of October 7, 2001. The timing of this war begs the question: how long does it take to plan and implement a major theater war several thousand miles away. Military analysts will confirm that a major theater war takes months and months, up to a year or more of advanced preparations. The war on Afghanistan was already in the advanced planning stages prior to September 11, 2001, which begs the question of foreknowledge of the 9/11 attacks. The repeal of civil liberties in America was launched in parallel with the bombing and invasion of Afghanistan, almost immediately following 9/11 with the adoption of the PATRIOT legislation and the setting up of a Homeland Security apparatus, under the pretext of protecting Americans. This post-911 legal and institutional framework had been carefully crafted prior to the 9/11 attacks. Important to the understanding of 9/11, US intelligence is the unspoken architect of “Islamic terrorism” going back to the heyday of the Soviet-Afghan war. Bin Laden was 22 years old and was trained in a CIA sponsored guerrilla training camp. Education in Afghanistan in the years preceding the Soviet-Afghan war was largely secular. With religious textbooks produced in Nebraska, the number of CIA sponsored religious schools (madrasahs) increased from 2,500 in 1980 to over 39,000. 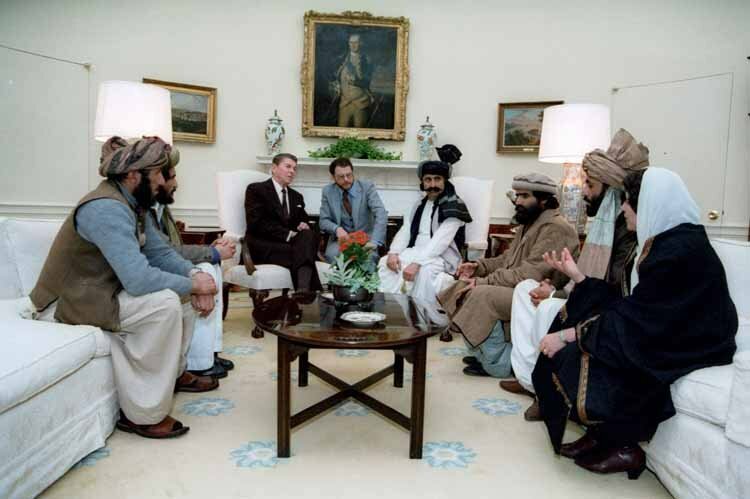 Under the Reagan administration, US foreign policy evolved towards the unconditional support and endorsement of the Islamic “freedom fighters”. This endorsement has not in any way been modified. In a twisted irony, throughout the post 911 era, US intelligence in liaison with Britain’s MI6, an Israel’s Mossad, continues to provide covert support to the radical Islamist organization allegedly responsible for the 9/11 attacks. Al Qaeda and its various affiliated groups including the Libya Islamic Fighting Group (LIFG) and factions within the Free Syria Army (FSA) are directly supported by the US and NATO. In a bitter irony, the US and its allies claim to be waging a “war on terrorism” against the alleged architects of 9/11, while also using Al Qaeda operatives as their foot-soldiers. 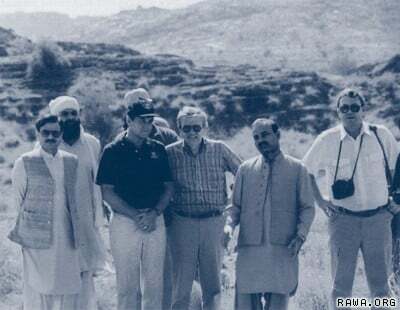 Milt Bearden at a Mujahideen training camp in North-West Frontier Province of Pakistan in 1987. You are so right there, Tim! Thanks Ed. All Western Governments must be implicated sadly, as all refuse to challenge the lies. As long as this is the case, how can any of them be trusted. If we know it, they must know it too and have probably worked through all the various scaenarios. It may also explain the international trend towards militarised police to prepare for the possibility of social disorder when the truth dawns. Hopefully it won't come to that, but certainly it requires an informed populace to reverse the drift and challenge those that see only war as their escape from a popular backlash. Dear Ed, It occurred to me to wonder (and I hope you do not think me impertinent in doing so) if you had ever considered applying your composing talents to this catacysmic event - possibly even in 9/11 time(!) ??? This started me thinking about musical tributes. Fortunately someone else appears to have done all the research as here for largely "popular" music: https://en.wikipedia.org/wiki/List_of_songs_about_the_September_11_attacks. Apparently John Adams, Steve Reich, Stephen Paulus, Joan Tower and John Corigliano among others have produced works, but this commentator still preferred works from the classical repertoire, such as Barber's famous piece or those of the 19th Century Greats.https://welltempered.wordpress.com/2012/09/11/what-classical-music-best-memorializes-the-terrorist-attacks-of-911/ A list of ten dedicated works are listed here: http://www.classicfm.com/discover-music/occasions/memorial/classical-music-inspired-911/anthony-davis-restless-mourning/ I must take the effort to listen to them. Regards, Tim.